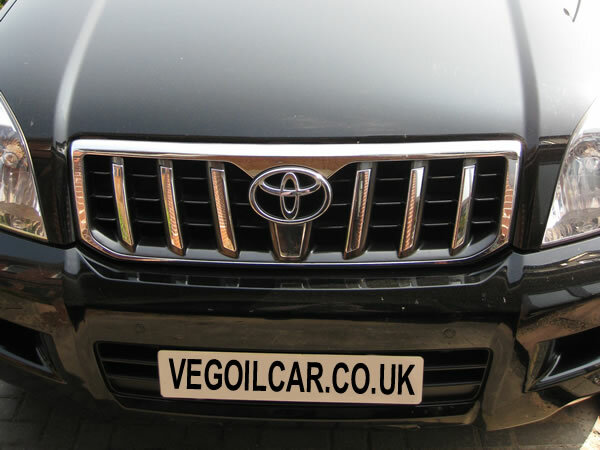 My car is a 2005 LC4 Toyota Landcruiser diesel and I love it. 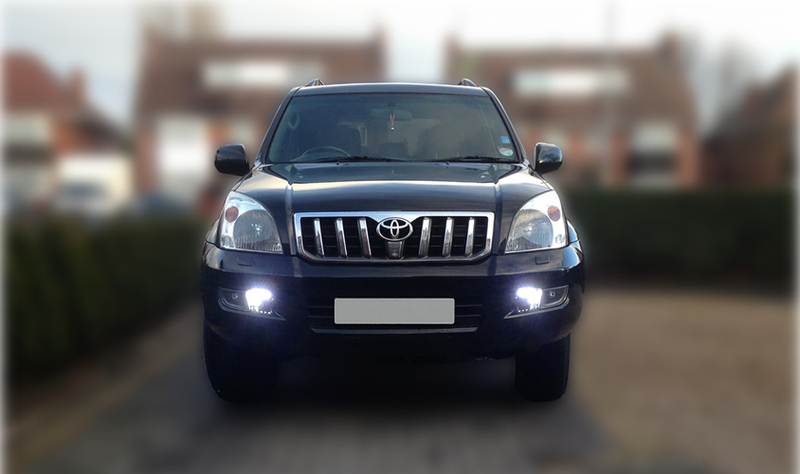 The idea struck me to add Daytime Running Lights to it but I just couldn't find any suitable for my particular model of Landcruiser. So I decided to build my own DRL's. 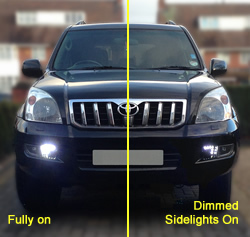 Most after-market DRL's seem designed to fit between the bars of the grill or spoiler. On my LC4 the number plate blocks this possibility and there's precious few other locations that I could make out - other than those wonderful gaps by the front fog lights! 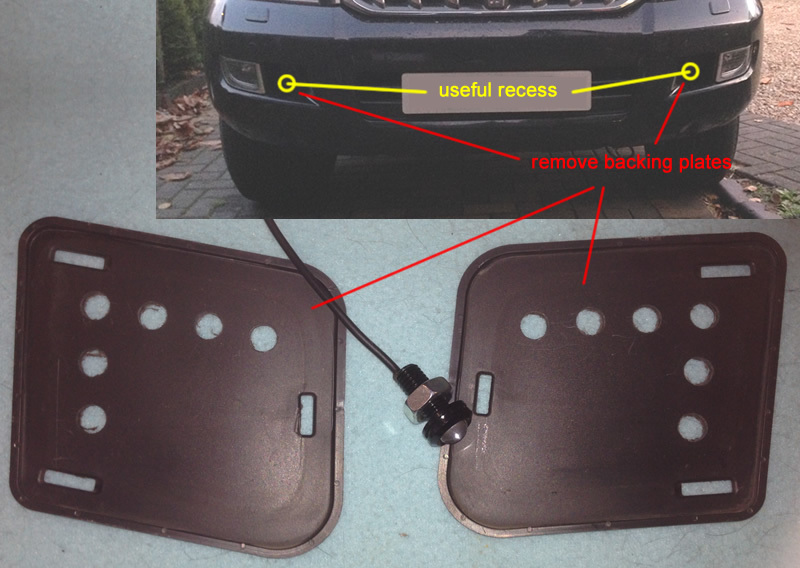 Directly next to either front fog light on my model of Landcruiser is a recess. At the back of this recess is a removal plastic cover plate. This makes a very handy location to fit DRL's - but again most DRL's are the wrong size and shape, so I opted for individual Eagle-Eye LED's. These are small, individual lights that despite being very bright use only around 3 to 5 watts of energy. 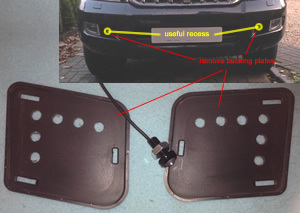 Below an image shows both the location of the recess and the two plastic plates removed from the vehicle. You'll see in the image that I have already drilled a few holes in each plate to receive the LED's - a simple process with a little time and care. You should also be able to make out one of the LED's. The LED's used here were called Eagle Eye LED's and mine came from eBay. I bought 12 for approximately £30. They come threaded and are provided with a M10 nut. Drill a 10mm hole, poke through the LED and tighten up the nut and you're done. Personally I added a second nut to each thread (there's plenty of room) to lock nut-on-nut (preventing the lights from loosening with vibration and movement). The number of LED's you can use is really a matter of personal choice. I liked the L-shape pattern that you can see in the image, though a single light would work well for those minimalists out there - the choice of number and design is yours. I'm fairly handy and confident with electrics. If you haven't a clue, I'd recommend getting help from someone with the necessary knowledge and skill. Car electrics can kill just as easily as domestic electrics! 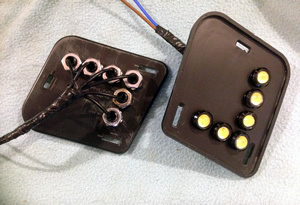 For those in the know, I simply clipped all the wires on the LED's to a more suitable length then joined all the positives and negatives together, thus in my case connecting six LED's in parallel on each backing plate. I then used a soldering iron to bond all the wires together with solder then applied a good, tight bond of insulation tape. 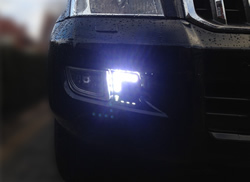 In the UK, Daytime Running Lights are required to turn-off or dim once the side-lights or headlights are turned on. Why? Simple really... these lights are very bright and need to be to stand out during a bright sunny day. Once the sun goes down these lights quickly become too bright and could easily dazzle other traffic users - a danger and an offence. To achieve this you need a controller. You can buy DRL controllers easily enough from Amazon, eBay, etc. They're not very expensive and all the electrical work is done for you. However the functionality of these controllers varies as does reliability it seems. 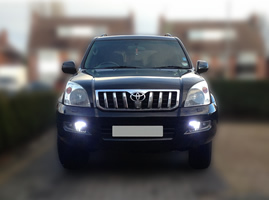 Personally as I was going to the trouble of fitting Daytime Running Lights to my Landcruiser, I wanted them to work during the evening hours as well and daytime, which meant conceiving a way of dimming them. Again for anyone with a little electrical knowledge, this isn't very hard - I simply used a dedicated PWM dimmer and a few relays. I'm happy enough to connect a few components together but I didn't really feel confident building my own PWM dimmer circuitry, so to me it made sense to buy one off-the-shelf. Consequently this whole design is far from complex - but basic is all I needed and it works perfectly. So here's the circuit I designed. As stated, the PWM was shop-bought from eBay. PWM stands for Pulse Width Modulation and this is the preferred method of dimming LED's. You could try using resistors but whilst this works nicely on ordinary bulbs, it has strange effects on LED's. For instance, in my set up, even though I had my LED's wired up in parallel, when I introduced resistors all the LED's but one dimmed... strange but doubtless something whizzy and technical that's beyond my mental reach. Thankfully an appropriate 12 volt PWM dimmer cost around £5 on eBay at the time of writing this in 2013 (I've included a picture). These are much smaller than the image suggests and I made mine even smaller by removing it from its plastic casing. A 4 pin relay is activated when an ignition source (A) is made live as the ignition key is turned on. This in turn allows a fused supply (B) to pass through the relay. I prefer this set up. Lots of after-market control units I saw for sale used the ignition source alone as the supply, a bad practice in my opinion as you could easily overload something you frankly shouldn't. Using a relay as an initial switch, which is exactly what the vehicle manufacturer will have done throughout your vehicles electrics, is a safer and more sensible approach. If anything goes wrong you'll only blow the fuse that supplies your DRL's rather than something more crucial. Because the PWM dimmer has both a positive and negative output, I used two 5 pin relays, one handling the positive supply and one handling the negative. In normal daylight conditions, full positive power flows from the fuse (B), through the positive relay and directly to the DRL's. Full negative power is also drawn through the negative relay with power drawn from the chassis (earth / negative). 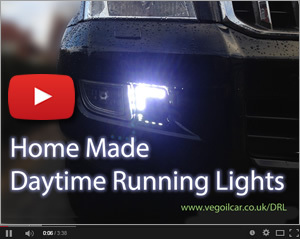 The result is thus full power to the DRL's - nice bright lights! When the sidelights are turned on (F) a positive flow activates both the positive and negative 5 pin relays and reroutes the supply through the dimmer circuit. 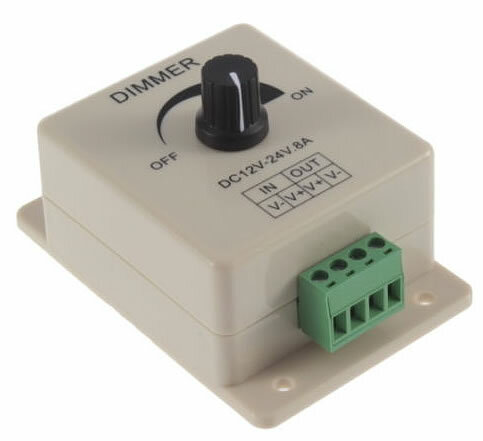 The dimmer has a potentiometer that varies the level of brightness. I turned mine almost fully down and this in turn reduces the voltage output and in consequence dims the LED's. No doubt there are many better ways of doing this task but this one worked nicely for me. I got both 5 pin relays for less than £5 off eBay and a couple of pounds bought the 4 pin relay. As mentioned the dimmer was just under £5 and an in-line fused supply line was £1. I already had plenty of wire knocking around and the whole lot when built squeezed nicely into a small plastic box. So my control unit worked out at around twelve pounds but, importantly, it does EXACTLY what I want it to do and it if goes wrong I'll hopefully be able to figure out where and why. For around £42 in total (LED's plus controller) I achieved a look I'm very pleased with, though it's a personal choice and others may feel differently. The DRL's are bright during the day and comply with UK law by dimming nicely in the darker hours. This was a nice project for me and if you'd like to do likewise, feel free. If you need any advice, feel free to contact me. I'm no expert but I'm happy to offer a little free advice.